About 14 years ago I came across two lemony sauce recipes to use on chicken and have made them both numerous times over the years. One is extremely easy because it starts with a can of broccoli soup from Campbells, and the other is simple because it only has a couple ingredients but a nice strong lemon flavor that pairs so well with poultry. Because I liked my two basic lemon sauces I don't typically look for other lemon based recipes but this one caught my eye and I decided to add it to my files. It's so simple with just a couple ingredients and the tang of the mustard blends with the citrus and chicken for a perfect Spring or summer meal. In a pan over medium high, heat the oil and add the chicken breasts. Cook, turn and continue cooking over medium heat, about 10-15 minutes until completely done. Remove the chicken breasts and keep warm. Turn the heat down to low. Add the butter to the pan and melt over low heat and add mustard, lemon juice and half and half while stirring with a whisk for about 2 minutes. Season with salt to taste. 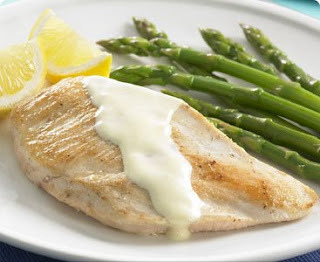 Place a chicken breast on each plate, drizzle chicken with lemon-butter sauce and garnish with thin slices of lemon. Goes great with asparagus, green beans or baby potatoes with rosemary.